After the death of an old king without an heir, an undead army would rise to chaos and splinter the foundations of peace and prosperity that would beforehand grace the lands of the kingdom. Those who attempted to claim the throne soon after would quickly meet a dreaded fate, resulting in the loss of will and the abandonment of the realm. Amid this tyranny, three unsuspecting strangers – a thief, a knight and a wizard – would stumble upon a lost artifact known as the Trine. This item would unleash a power that would bind them as one and seal their fates in an attempt to bring balance back to the land. It’s been nearly 10 years since developer Frozenbyte first released the original Trine to the masses. Since then, there have been two sequels and a fourth game currently in development. Trine is a game that I have heard about in the background many times, yet never really paid any attention to what it was all about. It could have been a turn-based Dungeons and Dragons game for all I cared. Yet, be that as it may, my own fate was sealed as I finally took the plunge to see what the fuss is about as Trine Enchanted Edition casts its way onto the Nintendo Switch. As it happens, Trine Enchanted Edition isn’t the turn-based game of wizards and sorcery that my ignorance led me to assume. It is in fact, a very competent action-platformer with physics-engine puzzle elements and a simple RPG progression system. In this enchanted adventure, you control three heroes who are combined as one unit. Each character can be swapped on the fly to play their independent role, making each one of them a necessity of being a team player as a crucial element for success. If I had paid attention beforehand to realise that Trine Enchanted Edition happens to be a callback to 90s classic The Lost Vikings, I probably would have dived into this one much sooner. In similar fashion to Silicon & Synapse’s The Lost Vikings (or Blizzard Entertainment as they are now known), each hero has a unique skill to keep the cogs of the engine running. Zoya the thief is light and nimble with her grappling hook and a crack-shot with a bow and arrow. Pontius the knight is a dab hand with a sword and shield providing both protection and close-quarters aggression. Amadeus, on the other hand, is rather useless in combat. However, his craft in wizardry allows him to conjure up cubes and planks out of thin air as well as manipulate their posting to aid the conjoined team across treacherous landscapes. The levels themselves are pleasing to the eye and work as a great host in making good use out of the heroes abilities. One minute, you can be slugging it out with an undead skeleton as the knight, to then suddenly transition seamlessly into the thief and grapple-hook your way to higher ground to pick off another enemy with the bow in the process. Once the danger has been tamed in the area, moving objects with the wizard provides a somewhat similar satisfaction to the magnetic rune ability that The Legend of Zelda: Breath of the Wild would eventually utilise. While the difficulty can be adjusted to be less forgiving, playing through the default normal setting rarely ever felt too much of a challenge. The puzzles littered throughout the stages more exercise the thumbs than they do the brain as overcoming obstacles usually requires little more than simply taking advantage of a hero’s strengths. Despite the lack of cranium conundrums, Trine Enchanted Edition is great at giving you something to do by granting you the freedom to approach each area in however way you see fit. Collecting chests and bottles of experience to both upgrade your character’s strengths and additional weaponry perks keeps the game feeling rewarding and a joy to explore. Each hero can also die individually until you activate a checkpoint, making some areas require you to take another approach towards something that would initially suit a fallen teammate. Heading down into the catacombs as a lone adventurer is all well and good, but Trine Enchanted Edition is at its best when experienced in co-op as each player unbinds a hero as their own. As well as upgraded visuals, this Enchanted Edition lets you share the experience online with friends or strangers. Like any good multiplayer game, however, teaming up with one or two friends sat beside you on the couch is always the best way to go. Cooperating and strategising each approach with buddies gives it that Legolas and Gimli banter from The Lord of the Rings movies, except you bully the Gandalf role into building structures for the muscle. Should the defenceless wizard be the last player standing, to be the one to overcome a room full of enemies using nothing but cubes, planks and clumsy telekinesis as his only source of attack can result in panic and hilarity. Especially as your teammates wait by in anticipation and angst for you to hit the next checkpoint against the odds. Where the adventure can stumble a bit is down to the lack in variety of enemies. You will be spending most of your combat skills slaying skeletons, goblins, bats and spiders and, besides a few bosses in between, the imagination in foes doesn’t really expand much further than that. What the game is good at though, is setting up the atmosphere of an epic journey. The tale is part-narrated with music and sounds that make you feel like an important member of a fellowship embarking on a spellbound journey. After nearly a decade, Trine Enchanted Edition still looks and plays as wondrously as ever. Its progressive reward system and ability to cater for gameplay variety keeps the adventure entertaining for the half a dozen hours or so it takes to complete the game. As a result, it suits the Nintendo Switch nicely despite the fact that the importance of a Right Stick makes split Joy-Con accessibility a missing feature. If you do happen to have a few sets of Joy-Con and Pro Controllers spare though, it’s certainly worth having a crack at multiplayer. 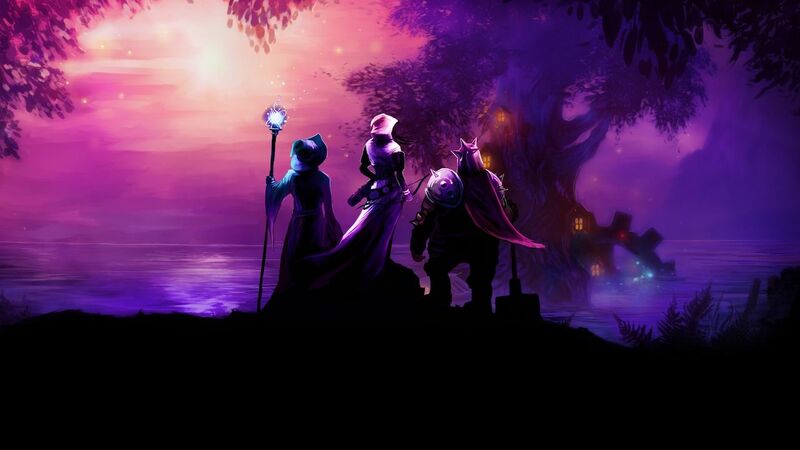 For Trine Enchanted Edition is best served as a team effort with allies you can depend upon.